After immigrating to the United States from Naples in 1913, Genovese became active in New York gangs, rose to control those gangs, then fled to Italy in 1937 to avoid U.S. prosecution. He became an illicit financier of Benito Mussolini and smuggled narcotics into the United States. 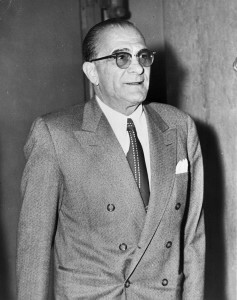 Returned to the States after World War II, he again rose to prominence as organized crime’s “boss of all the bosses” in the New York area. Convicted on smuggling and narcotics charges in 1959, he was imprisoned, but continued to rule the underworld from his cell. His reign was finally ended by a fatal heart attack, while still in custody.